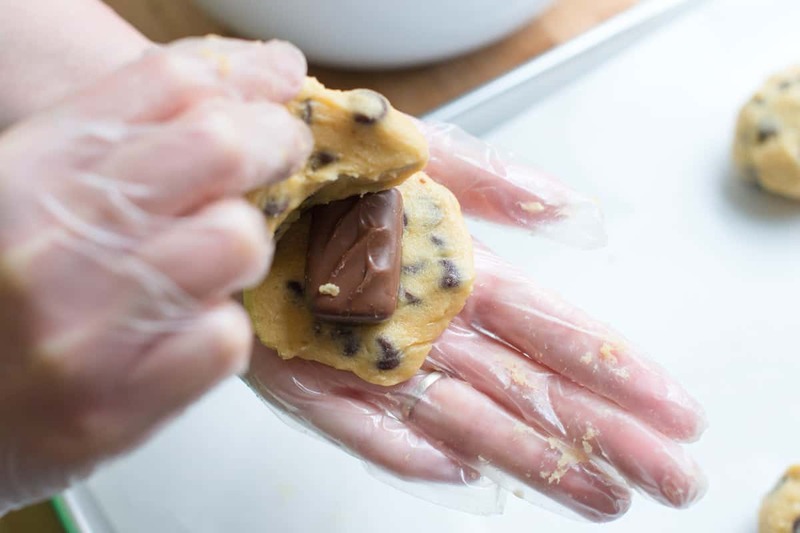 How to make stuffed cookies with your favorite candy bars. Jump to the Milky Way Stuffed Cookies Recipe or read on to see our tips for making them. Have you ever had a stuffed cookie? 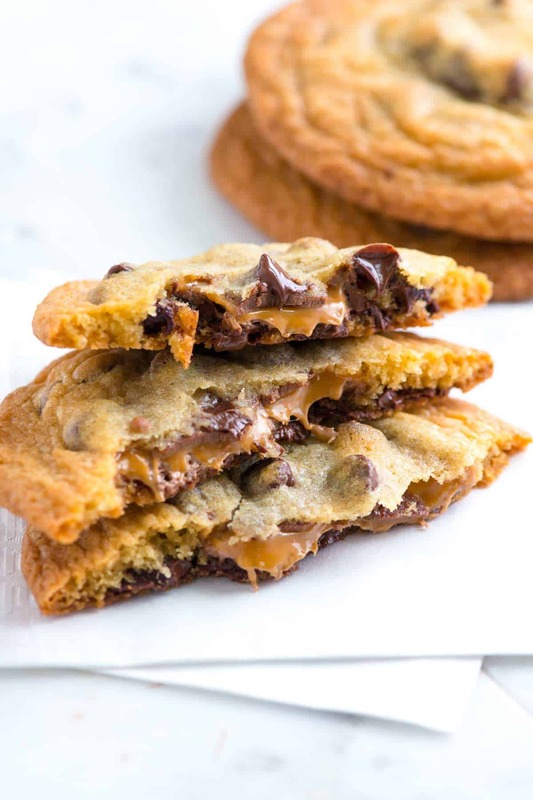 We hadn’t until these amazing, gooey stuffed cookies with Milky Way bars. We’re still cleaning our fingers from all that chocolate and caramel. (Not that we’re complaining). We made our own cookie dough, but if you have a favorite store-bought cookie dough in mind, use it. It will work great. 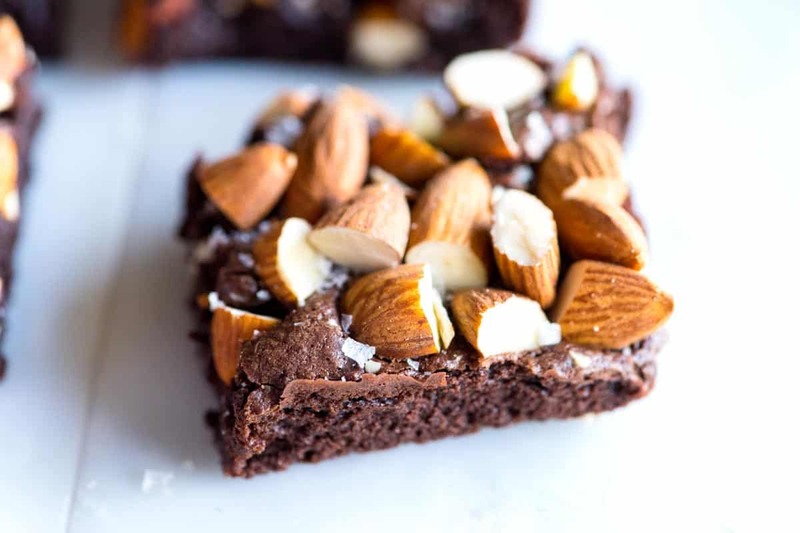 YOU MAY ALSO LIKE: Rich and fudgy brownies topped with almonds and sea salt that are easy to make from scratch. Jump to the Salted Almond Brownies Recipe. These cookies are really easy to make — all you need is an extra 5 to 10 minutes so you can stuff a fun-size Milk Way inside cookie dough before baking. We make our own cookie dough, but if you’re in a pinch, use a store-bought cookie dough, it will still work. If you do make your own cookie dough, you probably have most of the ingredients in your kitchen right now. See how we sneak a whole Milk Way in into the middle? It’s almost wrong! (We said almost). By the way, if you like another small or fun-size candy bar a little better than Milky Way bars, use it. Snickers would be amazing! 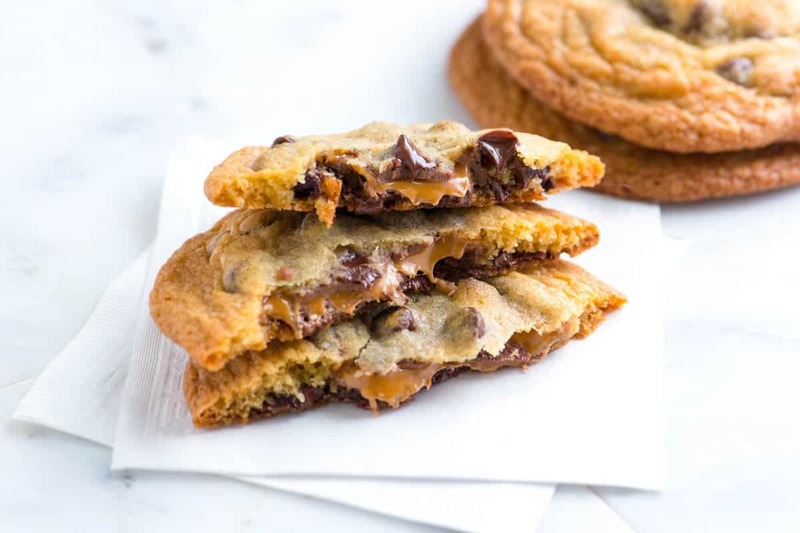 This stuffed cookie recipe is really easy to make — all you need is an extra 5 to 10 minutes so you can stuff a fun-size Milky Way inside cookie dough before baking. We make our own cookie dough, but if you’re in a pinch, use a store-bought cookie dough, it will still work. (If you do use store-bought dough, watch the baking time as it may vary from what we share below). Also, feel free to switch out the Milk Way bars for your favorite small or “fun-size” candy bar. 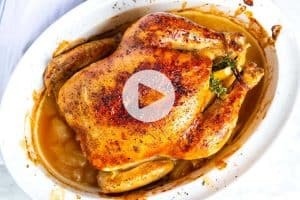 Heat oven to 375 degrees F. Line two baking sheets with parchment paper or a silicone baking mat. 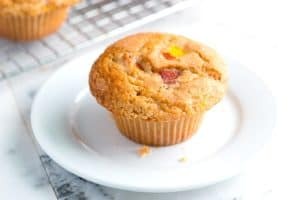 In a large bowl, beat the butter, both sugars and the vanilla extract on medium speed with a hand mixer until creamy, light and fluffy, scraping down the sides as necessary. This should take about 2 minutes. 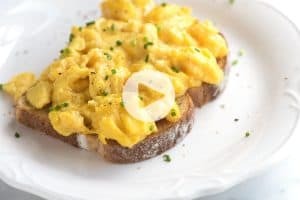 Add eggs, one at a time, beating until blended. 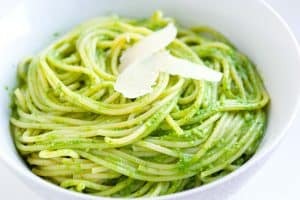 In a medium bowl, whisk to combine the flour, baking soda and the salt until blended. Add the flour mixture, in three parts, to the butter mixture, beating until incorporated and scraping down the sides of the bowl as necessary. Stir in the chocolate chips. 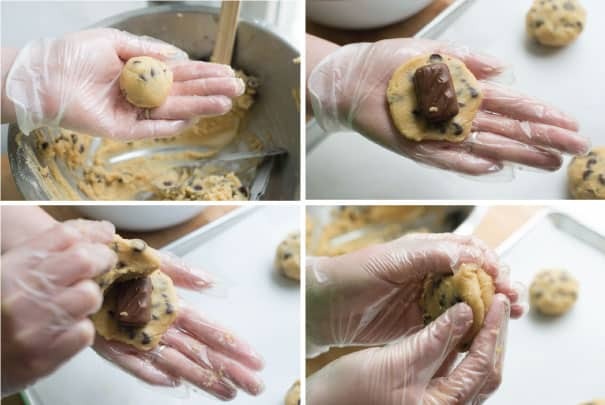 Use the palms of your hands to roll about 12 cookie dough balls, using 2 tablespoons of dough for each. Flatten one cookie dough ball, place a Milky Way into the middle. Flatten a second cookie dough ball and cover the Milk Way. Crimp the edges so that the Milky Way is completely covered. Repeat with remaining dough. You should be able to make 12 to 14 stuffed cookies. Bake cookies 10 to 15 minutes or until the cookies are light golden brown. (It may be helpful to rotate baking sheets half way through baking). Cool cookies on the baking sheet for 10 minutes then move to a cooling rack to cool completely. Or enjoy warm while the Milky Way is still molten. Can you do these with Snickers? Will they melt the same way? Yep, that would be great. These look very good, but was wondering what i would have to do for a batch of 36 cookies?? I made these and they turned out wonderful. Followed the recipe exactly. Thanks for the post! Delicious!! Made some with Milky Way, Snickers, and Reese Peanut Butter Cups. The PB Cups were the only ones not to flatten out – but no complaints at all!! All my boys enjoyed them 🙂 Thanks for another great recipe! Oh, yum! What a great selection of candies to stuff into the middle! I followed the recipe, however mine didn’t flatten out like yours did. I ended up with a still square milky-way in the center of quite a thick cookie. Good verdict on taste though! If not quite how they were supposed to be! They look incredibly good! Thanks for the recipe. Amazing! Anything “stuffed” in a cookie is a plus in my book! Oh my goodness, what a fabulous cookie!